As an IT professional, you know that the majority of problems facing your team on a daily basis can't actually be solved by a simple, have you tried turning it off and on again? You work to align your company’s technology with the people and processes. And with that comes a variety of challenges. Reviewing those common struggles can help you find the real solution. So let's dive in. According to our 2017 State of Contract Management Report, sales, legal, finance, IT and executive teams topped the list of the departments involved in the contract process. And that tends to mean a lot of content, hiding in many different places. In order to serve the customer in a friction-less way, the documents shared between each team member must be backed up, stored efficiently and readily available. 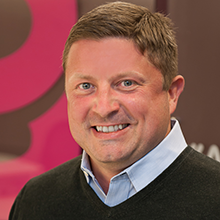 But as the number of parties involved grows, it gets increasingly difficult to manage the right place for a contract to live and content silos can quickly start to become an unfortunate reality. What if a team member loses track of a document buried in an email thread and mistakenly uses an outdated, unapproved version? Or another stores the sole copy of a contract on his laptop and the hard drive breaks? With a cloud-based document management platform you can provide the greater team a scalable solution to these logistical and administrative barriers and lay the foundation for a mechanism that will streamline the contract management process from IT out. When you’re working in an internal system or across disparate platforms, it can be a constant challenge to ensure sensitive data remains protected. Who can see what? Who can edit what? And at what point during a workflow does an individual’s access need to be restricted? These questions require proactive collaboration with key stakeholders, so you can start to design and automate the process from a foundational level. But establishing a security compliant distribution system — without creating additional friction in the sales process — is oftentimes easier said than done. More often than not, remaining compliant is the number one thing that's keeping you up at night. Security and compliance will always be an ongoing challenge, even more so as the gulf between traditional IT and digital innovation continues to grow. Contracts need to be organized efficiently so that they are easy to find, track and report on. If hosted in the cloud, they need to meet a host of compliance levels to make sure your data is secure and integrated correctly with your existing infrastructure. If you’re running and configuring your own software, that means you have to test it. You need to consistently ensure the system continues to work and any potential downtime threats are mitigated, so that your team always has full access to their content any time they need it. It can be all too easy to get caught up in this maintenance cycle and spend the majority of your scarce IT resources working on systems that stray from the core competency of your business. Whether it be in the form of tickets, emails or a phone call from your boss, a seemingly average day can quickly be consumed by a variety of unexpected support tasks. If it feels like you can never focus on strategy, it's probably just another day in the office, right? Time sinks are a constant challenge for every IT team, and when it comes to contract management, you have to find innovative solves that go far beyond bandaids. That includes training and empowerment: when your users are better able to access documents and contracts on their own and they know how to take appropriate actions within the workflow, you'll see fewer tickets and fewer fire drills. Your team likely puts as much energy as each member can muster back into the effort to maintain compliance and organizational speed. 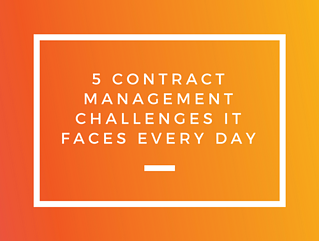 But these contract management challenges — which never seem to ebb — can bring that energy down. In this case, you have the ability to impact the process and how people use it. Whenever you're bogged down in these day-to-day challenges, try to take 15 minutes to step back and list a possible solution for the future. Whether it's better contract management software, a new workflow for redlining and generation, or just a training for a certain team, your long-term ideas, when implemented, will make the near-term difference.